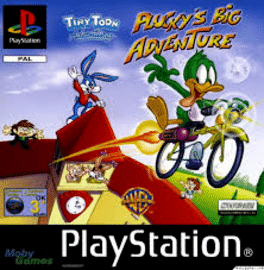 Players head out for an adventure with the Tiny Toons gang in Tiny Toon Adventures: Plucky's Big Adventure for PlayStation. In this title, based on the Tiny Toons animated series kids can play as Plucky, Hamton, Buster and Babs as they explore twenty-plus levels of Acme Looniversity in search of parts for a time machine for Plucky. While avoiding the incorrigible Elmyra and Montana Max, players help the gang seek out the time machine parts in order for Plucky to travel back in time to finish his homework. Searching all over the Looniversity in Acme Acres, players explore many places including the music room, history room, tennis courts and hallways. Items will vary from a bicycle pump to a potato and once an item is found, players can proceed with the level or return to the controlling character's respective locker to store the item. Each character can carry only three items at one time and players must decide which items are the most useful for each current level. Certain items are not time machine parts but rather will be used to acquire parts later in the game.